Gene Christian was born on a farm in Little Rock, Ark. on Feb. 22, 1926. During his childhood the family moved to Oklahoma in 1929, then in 1935 to Rocky Top, Tennessee. Many of Gene's relatives played music on the back porch every night. His Uncle Virgil played guitar and Cousin Dee Haston played the fiddle. This is where Gene got his incentive to learn to pick. Gene was destined learn to play the guitar, mandolin, and fiddle in his early years, around 1939. Gene's idols at that time were The Monroe Brothers (Bill and Charlie) and the Bailes Brothers. In 1941 Gene decided to visit Miami, Fla. There he met Ervin and Gordon Rouse. They became lifelong friends. Ervin Rouse, the writer of the Orange Blossom Special, had a great influence on Gene and was one of his dearest friends. Gene returned to Tennessee in 1943 and was joined by the Ferguson Brothers at WLAC radio and at the Dunbar Cave in Clarksville, Tenn., where Roy Acuff's band played. They played the Friday Night Frolic from 1947-1950 in Nashville. Gene says many country music stars got their start playing music at this radio station. While performing there, he met many of his lifetime friends such as Benny Martin, Chubby Wise, Vassar Clements, and Rual Yarbrough, all of whom played an important part in his future. These men stayed very close friends their entire lifetime. The future held a spot at the Grand Ole Opry for Gene as a replacement for Benny Martin in Bill Monroe’s band. A longtime dream had come true as he toured the country as the fiddle player in Bill’s Bluegrass Boys band. Together they did many shows on TV and radio. In 1954 another link in the music chain was connected when he filled in with the Flatt and Scruggs band and toured with them. In 1955 Gene left the other groups to form his own band, The Hillbilly Pals. During this time, Rual Yarbrough joined Gene’s group as the upright bass player. Not having a 5-string banjo in his group, Gene asked Rual if he could pick up a banjo and learn to play it. Rual decided to do just that and he traded his bass for a 5-string banjo and soon started playing with the group. Later in 1955, Ervin Rouse drove up from Miami to Rocky Top, Tenn., to ask Gene to accompany him to Nashville to record his song Sweeter Than the Flowers. They went to Nashville and played the song for many musicians and celebrities. While they were staying at a hotel where Gene says only preachers, wrestlers, hillbillies, and Bluegrass pickers resided, Moon Mullican talked Ervin into letting him record Sweeter Than the Flowers on King Records. It became a big hit for Mullican. After returning to Miami, Ervin and Gene attended a show one night at the Dade County Auditorium where Cracker Jim, the biggest promoter in Florida at the time, had Benny Martin, The Carter Family, and Johnny Cash scheduled to perform. It was there that Mother Maybelle Carter introduced Ervin and Gene to Cash. Ervin and Gene did the Orange Blossom Special for Cash backstage. Cash was so impressed with the song that he persuaded them to go on stage and do the OBS and Sweeter Than the Flowers for the audience. They did the tunes, and Ervin and Gene brought the house down! Cash asked Ervin to write down the words to the OBS for him so that Cash could record it. Ervin gave permission for him to do so, and within 4-5 months the Orange Blossom Special was on an album by Cash. 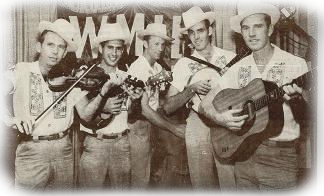 It was at this time that the first bluegrass band in South Florida was formed -- The Country Pals. It consisted of Eddie Dee, Henry Cook (inventor of the electric foot-pedaled banjo), Buddy Blair, Rob Thayer, and of course Gene Christian. This band won the Arthur Godfrey Talent Show program in 1956 with their version of Salty Dog Blues. The audition according to Gene was harder to win than than the show itself. After winning the show, the Country Pals had over 100 telegrams with offers to go to different states to perform. Instead of traveling they chose to do several programs for KTHS TV in Berryville, AR. One program was called Coffee Sipping Time, and another was Farm and Home Hour. After doing the TV shows for some time and receiving tons of fan mail from several states, they toured the southeast with various musicians, among them Benny Martin. At the same time they did one-night stands in almost every big hotel on Miami Beach, at a time when hillbilly music was not featured in the up-town Beach hotels! 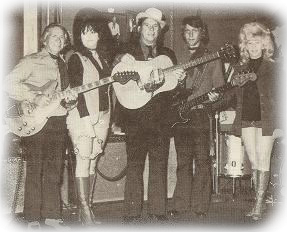 The first Gene Christian and the Nashville Gents and Gals band was formed in 1962. It consisted of Charlie Justice on fiddle (later to play fiddle in the George Jones band), Don Jarrells on rhythm guitar, Jimmie Morgan on steel guitar, Henry Cook on the 5-string banjo, and of course Gene Christian on rhythm guitar, fiddle, and lead vocals. Vera, one of Gene's daughters, was introduced to show business at the Fontainebleau Hotel on Miami Beach at the young age of 14 (Vera is second to the left, next to the guy with the big electric guitar, in this photo). She sang and played the tambourine. This group was very versatile as they could switch instruments and play Bluegrass or Country music. Gene says, "Back then you would have starved to death trying to make a living just playing bluegrass!" In the spring of 1965, Gene decided to take the bull by the horns, the Black Angus Bull Restaurant horns, and make a bigger name for himself and his band. They performed for the Black Angus chain for 20 years. It isn't hard to figure out why. Gene possesses a vibrant personality that is easily accepted by all. His fedora hat from Tennessee is his distinguishing trademark. Update: Gene Christian passed away on October 4, 2013. RIP Gene.